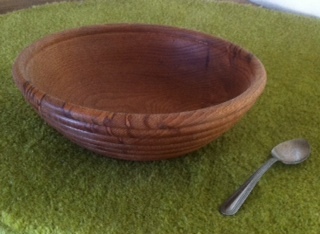 I love wooden bowls. I became interested in them when I started postgraduate research on Viking age woodturning in Dublin, and started to accumulate this lovely eclectic assemblage soon after. I’ve had to stop the PhD research for now, and my contract at the project where I got to work with them wasn’t renewed, but meanwhile the bowls are fun to look out for. They’re attractive and hardy and best of all, I don’t just pile them in a corner or display them on a shelf. I like to make sure they get used. We use the big ones for salads and dishing up hot food, and the small ones for snacks and dips. Wooden tableware just needs to be dried immediately after washing (not in a dishwasher, which our house doesn’t currently have). Some of them we just use for gathering small clutter, keyrings and allen keys and the kind of small toys shrapnel that seems to just materialise out of nowhere. My favourite is the beehive-style beech one. I bought it from a Wicklow woodturner who was working on the Asgard ship conservation project at the National Museum of Ireland. It was relatively expensive compared to the others, but worth it. It complements any food, and strange as it may be to say, it has a lovely sound. It makes a soft resonating thud when you put it down or scrape it with a spoon. 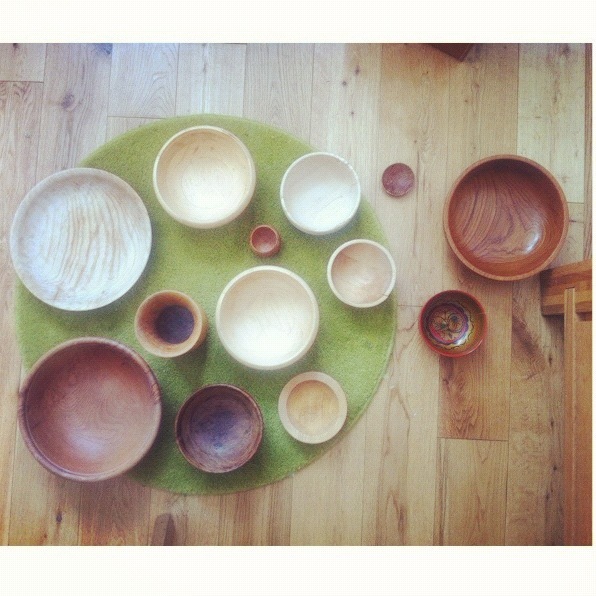 Using wooden bowls and plates makes for a much quieter mealtime than the more conventional ceramic tableware. Another person I’ve known to refer to the pleasant sound of using wooden tableware is Robin Wood who turns beautiful functional bowls and plates on a a foot-powered lathe, Robin turns stylish but functional bowls and plates in the traditional way. I bought one of my other favourites from him online. It’s the dinky little bright one with lovely visible turning lines on it, the way medieval woodturners used to pole-lathe-turn their vessels. My daughter had her first solid food dinners in this bowl. I sent Robin a picture of her using it and he put it on his blog. 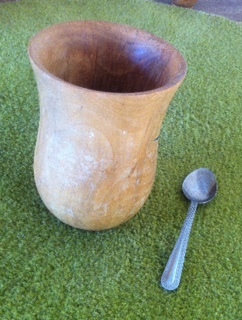 Another, a small oak one, I bought from a gift shop in Dingle; the owner is also a woodturner. I’m fortunate that many of my best bowls found their way to me as gifts. I have a nice spalted one that was made for me by a former colleague at the National Museum, who turns wood on an electric lathe in his spare time. One, the large dark one, was a gift from my brother. He picked it up for me in TK Maxx. The large low bright ash one came in the post, a gift from fellow researchers in Cornwall. The tiny honey pot was another thoughtful gift from a former colleague on a visit to Roskilde in Denmark (photo is below). It came with a tiny wooden spoon, which I swear is hiding in our house somewhere. The one in the centre of the photo at the top is actually a beautiful walnut vase, a gift from another colleague bought at a crafts fair somewhere in England. It’s stained inside from using it to store pens and pencils when it’s not being used as a vase. Others I got in charity shops, or even IKEA. The IKEA ones I have aren’t turned from a single piece of wood though: I can’t figure if that’s cheating, or economical. I can rarely pass a charity shop without nipping in to check their household wares shelves to see if they have any new turned wooden treasures. Phibsborough in Dublin 7 is a rich picking ground for good charity shops. The picture at the top doesn’t show all of my collection, because my one-year-old kept swiping them to play with when I was lining them up to photograph. That’s another pleasant use for my lovely bowls: playtime. My four-year-old and one-year-old like getting them all down on the ground for their games, for putting their toys in or just simply for stacking. I have my own pole lathe, which I built on a course given by Eoin Donnelly over two different weekends. I don’t know how to use it yet and I haven’t had time to learn or practise. I also did a ten-week course in DIT using an electric lathe, which I did sort of get the knack of but it’s quite different to operate. 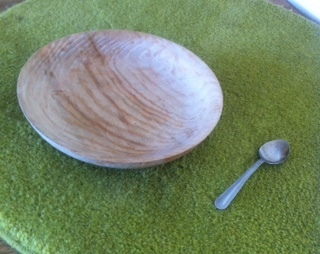 I’m not quite intending to try to make bowls myself, yet; one doesn’t move straight onto making bowls when learning lathe-turning craft in any case. You start off on straight spindle items like chair legs and lamp stands. This entry was posted in Kettle Thoughts and tagged wooden bowls. Bookmark the permalink. This is something I too have always wanted to do but never got around to. I love wood!!! Instead I taught myself to spin and crochet, having learned to Knit in the convent in Graiguenamanagh when I was a child. You gotta love the nuns!!! I now have my one little black sheep, a female so we can breed her here in Luxor, so hopefully I might have my own flock in the next year. Inshallah as they say here ‘God willing’. Wood here is so expensive but they make things from palm wood, which is not as nice as the beautiful woods you get in Ireland and the UK. I plan to do some workshops using a pole lathe in the future though. Even if I do have to use palm wood!! Anything is possible. I have found in my limited experience of any kind of woodworking that it is extremely therapeutic. I must post about making the pole lathe, which is fun and rewarding but learning how to use it is a whole other ball game for me. Check out Terry’s comment below about an electric lathe too. Might be an idea! This is really interesting to me. 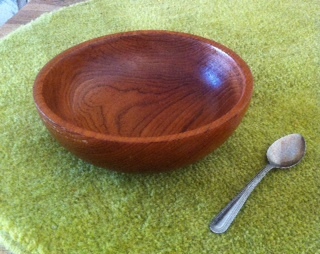 I’ve been making wooden bowls for a long time. I use an electric lathe and don’t think I would recommend anyone to use a pole lathe unless just for the experience. Very few people can do good work on them – Robin Wood being one. On an electric machine, bowls are easier than spindles, there’s no reason why you shouldn’t start with a bowl. You can’t be interested in turning and not make some! But they do say you have to make a lot of bad ones before you can make a good one. It’s a fascinating craft and I would be interested in your Viking research. 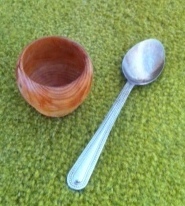 You can see my wooden bowls here. I’m glad you like my work! I’ve tried turning on a pole lathe. You might think that as they are so simple, they would be easier to use, but I found it very difficult. You stand on one leg and it’s hard to keep steady. The cut is interrupted all the time and the speed is slow. I have never seen good quality new turnings produced this way, most are very crude. I’d suggest getting a DVD on turning and having a go on an electric machine. It still takes lots of practice of course, but there is a reason they have superseded the pole lathes. But I’d like to read about your project.